The quest for cleaner energy encounters limitations. Two hundred years ago, Thomas Malthus claimed famously that the population of the earth would go on increasing until it ran into famines and epidemics. Back then, there were 1 billion humans on the planet; now there are 7 billion of us, but a Malthusian cataclysm is nowhere in sight. What saved us was technology. If our medicine and agriculture stayed at the same level they were in 1798, famines and epidemics surely would have limited population growth. But now we may have become too complacent in our trust in technology. In particular, we’re confident that technological solutions could not only get us off petroleum as a main source of energy, but do so by substituting harmless “green” technologies for hydrocarbons. Over the past four decades, technology has altered projections in the global oil market. During the double-whammy oil crises of the 1970s, analysts confidently predicted that by about now the world would be out of petroleum—and in fact output fell toward 50 million barrels per day (mbd) in the early 1980s. But now the world is producing nearly twice that amount in order to accommodate demand coming from China, India, Brazil, Indonesia and other emerging economies. Yet, even at its peak in 2011–13, oil’s inflation-adjusted price was about the same as after the 1979 Iranian revolution. And now it is back to where it stood in the mid-1970s. Spectacular progress in the development of oil exploration and extraction technologies has prevented the depletion of oil reserves. In 1980, the world had 640 billion barrels in proven reserves. That amount had been pumped out by the early 2000s, but today recoverable reserves have actually increased to 1,624 billion barrels. However, while solving one set of problems, technology tends to create another. New communication and production technologies have led to economic development and the emergence of large consuming classes in Asia, Latin America and even Africa. This impacted oil consumption directly, through the expansion of car ownership. The number of cars on roads around the world stood at 750 million in 2000, but jumped to 1 billion in 2010. It is increasing by 3% every year. By around 2030, we’ll be driving as many as 2 billion cars. Since cars account for more than half of oil consumption, the global oil industry will need to come up with 130 mbd of oil at current consumption rates. And if China and India, with their current populations, raised their per capita oil consumption to U.S. and Canadian levels, they alone would require 150 mbd. Burning so much oil would create oil shortages and increase pollution. Whether or not we accept climate change projections, carbon monoxide, nitrogen oxide and other harmful emissions have been found to create a variety of health problems, ranging from heart failure to birth defects and higher child mortality. China’s urban areas are already highly polluted, and India is going through an epidemic of respiratory illnesses in its major cities. But of course all these problems will be resolved by new technologies, won’t they? Attempts to diversify away from oil are not new. They have been spurred since at least the 1970s by political as well as economic concerns. Brazil pioneered the production of ethanol from sugar cane. The U.S. ethanol industry is now well-established and politically influential. Amazingly, more than a third of the U.S. corn crop is used to produce ethanol, which provides 6% of U.S. gasoline needs. The International Energy Agency forecasts a massive shift toward diesel engines by 2025. Diesel engines are as much as one-third more efficient than gasoline engines; besides, there has been a major push, including investment by governments in the U.S. and Europe, to produce biodiesel. However, the World Resources Institute, an independent environmental think tank, recently issued a highly critical report. Ethanol and other such fuels are renewable and fairly clean, but they provide at least 30% less energy than gasoline, and use land, fuel and other scarce resources to produce. While some technologies, such as biodiesel from algae and waste products, may be more effective, they remain years away from commercial use. While progress has been slow, there has been a notable reduction in dependence on petroleum in powering motor vehicles. This has been reflected in a steady rise in miles-per-gallon statistics. The U.S. Corporate Average Fuel Economy standards have gone from 20 mpg in 1980 to over 30 mpg currently. Based on federal regulations, the average car sold in the U.S. in 2025 will have to achieve 54.5 mpg. In Europe, Japan and China the requirements will be similar or higher. These also go hand-in-hand with tougher emission requirements. 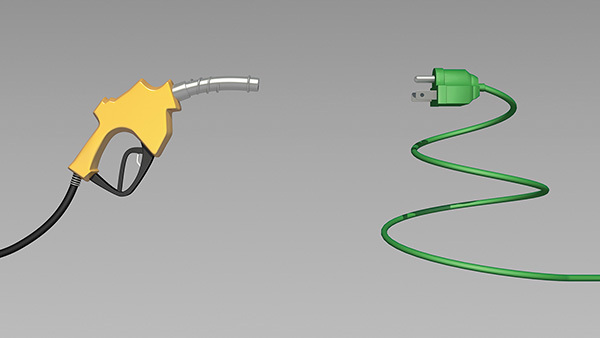 Hybrids and electric vehicle technology will play a key role in boosting fleet gas mileage and cutting exhaust, especially after 2025, according to the IEA. Hybrid technology has become established. Market leader Toyota has sold around 7 million such vehicles. Car companies also sell over 600,000 plug-ins annually. Combined, electric and hybrids now total 80 million worldwide. For now, they’re only 8% of cars on the roads. But the more electric cars ply the highways, the greater the pressure there will be on the power grid. The superchargers used by BMW need 24 kilowatts per hour, the equivalent of almost 50 average households. Tesla, which charges from zero to full in less than half an hour, uses the energy of over 200 average households. Such surges would require adjustments on the grid and, of course, much more power generation. That’s where the problem lies. Renewable sources—mainly hydroelectric—account for about 20% of world power production. The largest source of power is coal, which is much more polluting than petroleum. Coal generation accounts for 40% of power worldwide. Moreover, in China, some three-quarters of electric power are from coal, and in India more than two-thirds. Those are countries that will see the largest car ownership increases over the next two decades. Brazil is a great champion of hydroelectric power, but its dams are built in the rainforest, which is certainly not good for the environment. While solar and wind power are becoming cheaper every year and their production is expanding, they are still a very modest contributor to total numbers, especially in developing economies. The World Energy Council forecasts a fourfold increase in green power production overall by 2020, but even then it will make up less than 9% of all power produced. And then there is the case of aluminum. Last year, Ford took a revolutionary step, unveiling a new all-aluminum F-150. It gets the highest mileage among gas-powered pickups, offering a 29% increase on its own 2014 model, because its body is 700 pounds lighter. Other carmakers have been relying on the metal to lighten their vehicles, as well. The Audi A8 has an aluminum body, and so does the Range Rover. Aluminum parts in the Jaguar have reduced its weight by 40%. Aluminum will be used even more extensively in hybrids and electric vehicles, since their electric motors are still less powerful than internal combustion engines. The auto industry already uses almost 20% of global aluminum output, and car production is the main factor in the projected rise in aluminum output from 50 million tons currently to 120 million tons in 2025. It sounds green until you consider the way aluminum is produced. There is no shortage of bauxite in many parts of the world, but getting it relies on strip-mining techniques and the release of perfluorocarbons, which are environmentally harmful. Plus, almost 3% of the electric power used around the world goes to aluminum smelting plants. If the production of the metal doubles over the next decade, there will be a large number of plants built specifically to provide electricity to smelters. Once again, since they will mostly be built in emerging economies, they are also likely to be powered by burning more coal. In short, while the shift away from petroleum will continue—causing soft oil markets and lower prices—technology is nowhere near to solving the accumulating environmental problems that go hand-in-hand with economic development.